I'm trying to learn more about the "foreign key references check" query plan operator introduced in SQL Server 2016. There's not a lot of information about it out there. Microsoft announced it here and I blogged about it here. The new operator can be seen by deleting a row from a parent table with 254 or more incoming foreign key references: dbfiddle link. Foreign Key References Count is the number of incoming foreign keys. No matching Indexes Count is the number of incoming foreign keys without a suitable index. Verifying that the updated or deleted table won't violate that constraint will require a scan of a child table. I don't know what Partial Matching Indexes Count represents. Dan Guzman pointed out that multiple column foreign keys can match indexes even if the index keys are in a different order than the foreign key columns. His code is here in case someone is able to use it as as starting point to figure out more about partial matching indexes. I spoke to people much smarter than I and we will be documenting this soon™. PartialMatchingIndexCount reflects the number of references that could be checked using index seeks, but the index key does not cover all the columns being checked. For example, the corresponding ForeignKeyReferenceCheck elements contain both a Seek Predicates and a Predicate element. If this number is greater than 0, there is a potential performance issue, in case the partial matches result in large numbers of rows. Searches for foreign key constraints that don't have fully matching indexes. Generates a CREATE INDEX template for each foreign-key with no matching index or a partial-matching index. 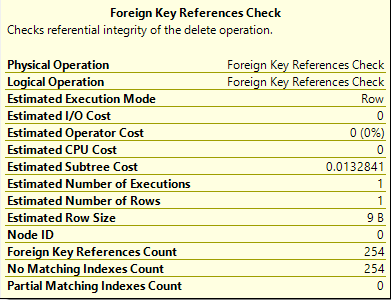 FKs missing full matching indexes can severely hurt the performance of DELETES on the referenced table due to table-scans for checking referential integrity, as well as SELECTS on the referencing tables where the foreign-key column(s) are in the WHERE or JOIN predicates (This will affect you whether a constraint exists or not). This only checks the first N columns of the index where N is the number of columns in the foreign key constraint. If your database has no foreign key constraints, then this tool will be worthless to you. Many databases have partial foreign key constraint coverage. This only works on related tables where constraints are declared. If I understand this correctly, if a FK relationship does not have an index that matches every column in some needed index, there may be some indexes that have some of the columns. For example, if a FK relationship has three columns (a,b,c) but there is no index with those same three columns, there may exist an index that has (a,b) or (a,c) or (b,c) and may help with queries but will require some index scans to rows with the missing column. If there are no indexes at all that can support a FK constraint, then the "Partial Matching Indexes Count" will be zero(0), or at least will not increment this count. Not the answer you're looking for? Browse other questions tagged sql-server index sql-server-2016 foreign-key or ask your own question. InnoDB foreign key and index duplication? How does SQL Server choose an index key for a foreign key reference?